The Titanic Facts on Titanic Food show the Titanic passengers had lots and lots of food. For its maiden voyage from Southampton to New York, the ill-fated luxury liner the history of titanic tells us that it was stocked with tens of thousands of pounds of meat, fish and poultry. Also on board the Titanic Ship more than two tons of sausages were in supply. Included elsewhere in the inventory was more than a ton of ice cream and approximately 40 tons of potatoes. As well as the food given that presentation and sheer dining elegance mattered a great deal on a luxury liner such as the Titanic ship, serving all of that food would require a lot of linen. The Titanic held thousands of tablecloths and napkins. The linen supply consisted of close to 20,000 bed sheets, as well as thousands of towels. The total linen supply of the Titanic ship approached 200,000 pieces. Here is some Titanic information regarding recorded different types of Titanic food on board the Titanic Ship and an estimate of the quantities in alphabetical order. Before all meals, the ship’s bugler would wander the ship decks, sounding the traditional White Star Line meal call, signalling that the Titanic passengers should make their ways to their respective dining rooms. Passengers on Titanic in First Class were by far the best fed. They had paid handsomely for this privilege with their ticket costing 8 times more than Second and over 25 times more than Third. As was the fashion in upper class circles in Victorian times, food was predominantly French in style though Roast Sirloin Beef still on the menu. Titanic First Class passengers tended to linger with cocktails in the reception room outside of their Dining Room before going in for the meal itself. They were then treated to a veritable feast at every meal. Suppers included over ten courses (with a diverse range of options), including a different wine served at each course. The meal was followed with fresh fruit and cheese, coffee, cigars, and port. 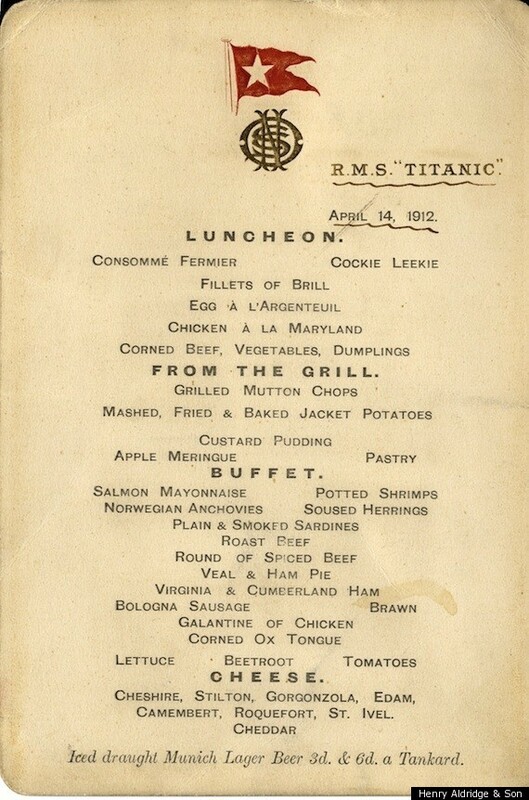 In addition to the gluttonous meals included in the ticket costs, first class Titanic passengers could choose to pay extra and dine in a more private restaurant with food made-to-order; or they could request in-room catering. Among the many items collected after the sinking were several of the on-board menus. The second class dining room was situated on the same deck as that of the first class, and first and second class shared a kitchen. It is likely that second class passengers were offered some of the same dishes as the first class passengers, without all of the fancy decorations. Like the first class Titanic passengers, they ate at four mealtimes throughout the day. Pudding was also more homely and on the sinking of the Titanic night , the second class passengers actually tucked into Plum Pudding, what we now know as Christmas Pudding. It should be noted that food served to passengers on Titanic in third class was simply scaled down versions of second class, passengers in steerage had little to complain about as for many this food was better than they had been used to. Third class passengers were not served dinner as the other classes, instead would partake of High Tea a custom which still exists today.The quality of the food was not high; rather it was heavy, plain, energy-giving food suited to the working class. Common foods included porridge, potatoes, cold meats. Irish Stew was mentioned frequently on the menu.